This talk will focus on seventeenth century Caucasian Dragon Rugs. The myth of the dragon traveled along the Silk Road, on the backs of camels through the villages of Karabagh, Tabriz, and Baku, on its way to Europe. 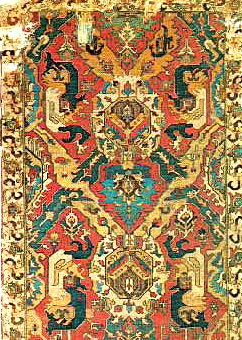 That image of the dragon became part of this weaving culture’s outward expression. The legends of the dragon in China and Europe are clear but I want to think about the path that lies between. There we find the footsteps of the dragon as it traveled west and through time. Denise Cain is a Graduate candidate in History, at CUNY, an aspiring collector and former assistant to J.H. Terry in Seattle.